LIVE DIGITAL CARICATURES THAT ARE ANIMATED!! Introducing Caricamation! The Evolution of the Live Digital Caricature Revolution! You've seen caricatures, you may even have seen digital caricatures, but you haven't seen Caricamation! While digital caricatures are nifty-they still fail to capitalize on the potential of today's technology and multimedia, it remains a still, silent image. Caricamation is a digital caricature that is ANIMATED AND also can have SOUND! Essentially it is a mini-cartoon customised to your company/ event! Not only is your company's logo in front of the eyes of your customers, your audio pitch can be in their ears as well! Available for all parties/ events/ trade shows/ conventions, school assemblies, etc. 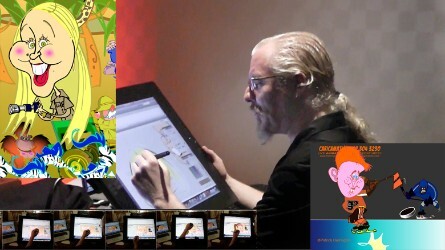 *Caricamation-live digital caricatures that are ANIMATED. Comic strips, comic books, etc. Watch youtube video for demo/ info on this innovative process.